For over a decade, New View Roofing has been installing low-slope (flat) roofing on commercial and industrial properties across the North Dallas-Fort Worth, TX, area. Because of the Texas heat, energy efficiency is our top priority. We provide high-quality installations and expertise in TPO, PVC, coatings and asphalt roofing systems. When Is It Time For a New Commercial Roof Replacement? If you notice chronic leaks, a spike in the cost of your energy bills, or if it’s been over 25 years since your last roof replacement, it’s time for a new roof. New View Roofing and our team of qualified contractors is equipped with the latest techniques and state-of-the-art equipment to install your commercial roof. We’ll work diligently to complete your project on time and cause minimal disturbance to your day-to-day operations. 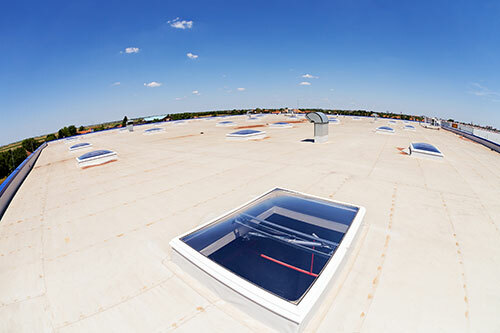 The team at New View has extensive training in industrial roof replacement services. We take into consideration things such as the Texas climate and weather conditions, durable roofing materials, and any future needs your property will face. When filing an insurance claim for your commercial or industrial property, we will work with your insurance provider directly to ensure you get a comparable roof replacement system. We want to help you get the most value for your claim! As a locally-owned and -operated company, we at New View Roofing understand the importance of a sturdy and efficient roof. We want to provide the same for other businesses in the area. Contact New View Roofing for a free inspection of your industrial or commercial roof and we’ll talk with you about your best roof replacement options. We proudly work on commercial properties throughout the North Dallas and Fort Worth, TX, area. Call (469) 232-7220 or submit our online contact form.